Recently I got a job for working with a pligg cms powered website. 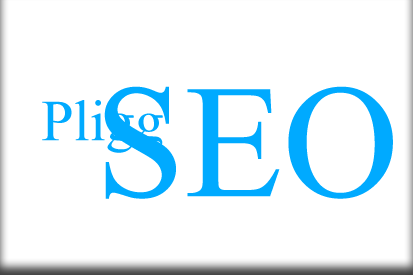 My job was to search about pligg seo and improve its search engine optimization. And I started searching about it in Google . But I got less information about it from Google. But I didn’t give up and starts working on it. I installed myself a pligg site starts learning about it. This article isn’t it covered 100% about pligg Seo. But you will get some more advantages if you follow some simple things with your pligg website. SEO basics are the basics of search engine optimization, which is used to help get your website listed higher in the search results on Google, Yahoo, Bing, and other search engines. This is very important if you are trying to make money online, gain more users for your pligg website. Since search engines give more reliable customers, you need to concentrate on submitting your sites to search engines. Top search engines are Google, Yahoo, ask and Bing. Even though there are thousands of search engines as a starter you need to concentrate on this top four search engines listed above. You can easily submit to google search engine following this link . Search engines such as yahoo and bing now using bing webmaster tools for indexing sites. You can submit to bing seperatly using this link. Urls are always very important factor for determining better search engine ranking. Pligg website urls can be changed easily. Change URLs and make your site more search engine friendly. After Login to admin area navigate to configure area Click on SEO where you will find URL Method and Friendly URL’s For Stories. Change the URL method to 2 and Friendly URL’s to true. This will help you to get some search engine boosting. Because out going links are redirecting links to original links. This will hide URLS submitted from your website. If you enable outgoing links also change Outgoing Links Placement to true. Open Story Link In New Window will make all links to open in new window. This will increase some search engine boosts And it will increase number of page views. To enable this feature just navigate to configure area where you will find story option. There you can easily enable this option. Creating XML sitemaps for pligg powered sites are very easier. You can refer this wonderful tutorial from patch log. This will let you create a sitemap for your pligg site. You can submit this sitemap to Google via webmaster tools. You can also ping all search engines directly from admin area. You can easily access your robots.txt file. First try to reach it in your browser. yourdomain.com/robots.txt. Then use ftp to reach robots.txt file and add following sitemap as shown in the given format Sitemap: http://domain.com/sitemap-0.xml at the top of the robots.txt file. I strongly recommend you to only submit your stories in this robots.txt file and avoid categories to avoid duplication of contents. This is very simple procedure to make a pligg site links to nofollow. Or you can simply change all external links to nofollow. This is coming with a Links Module. Search for Links module in your admin Home page. Can’t you find some thing similar in your admin area? 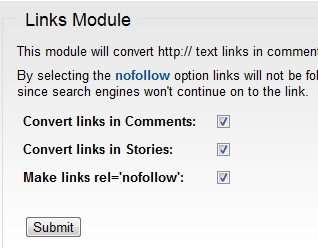 Then navigate to modules area and in uninstalled modules you should definitely found Links Module. Install it and set links as shown in the Below given Picture. This will definitely improve Pligg Seo of your Pligg Site. Because link juice is not very good for search engine optimization. Recently i got a lot mails asking how to add google webmaster tool verification code and adding Google analytics code to a pligg Website. I made a detailed tutorial to add pligg anaylytics. Read Adding Google Analytics Code to Pligg Website to give improve Pligg Seo by monitoring analytics data. It is a very simple procedure. I am not going to elaborate this discussion any more. Login to admin area>Then find template>A drop down with no: of files>find Pligg.tpl file>Search for tag and add meta tags just before this tag. I think i included many necessary aspects of pligg seo. I am not expert in search engine optimization. But what i covered in this article will be very useful.